Sizanani Home was founded in 1993 by a Roman Catholic priest, Fr. Charles Kuppelweiser, primarily as a residential facility for children and young adults with moderate to profound intellectual and physical disabilities. We are located in the Gauteng Province of South Africa, just outside Bronkhorstspruit, within Sizanani Village. The Village houses various social programmes, such as an HIV/AIDS and community development centre and a school for learners with special needs, and although these used to be governed as one organisation, they have been unbundled in 2000 and have since been operating independently from each other. Sizanani Home currently cares for 66 children and youth, their ages ranging between 4-34 years. Our residents are accommodated in 3 independent dormitories, according to their gender and level of independence. 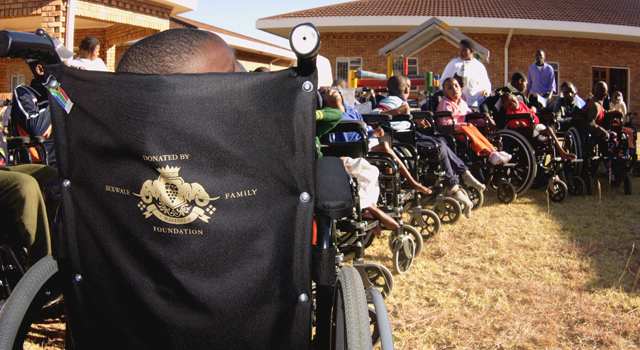 Many of the children have severe to profound disabilities and require 24-hour care. These children cannot walk, talk or feed themselves, and many of them have severe deformities, which further limit their abilities and potential. In line with international best practices and national policies, recent years have seen our organisation expand its community-based programmes. Our goal is to minimise the need for institutional care by providing a wide range of community-based services, enabling families to care for children with disabilities in their home environment. In addition to our residential facility, we currently operate 3 day care centres, a group home and home-based care programmes in 3 township areas around Sizanani Village. We are licensed and subsidised by the Gauteng Provincial Department of Health, but this subsidy only covers approximately 50% of our costs. The Home therefore also relies on individual and corporate donors, both locally and from around the world. We are very grateful to all our supporters, without whom we could not continue caring for our special children and giving them all the love and attention they so deserve!